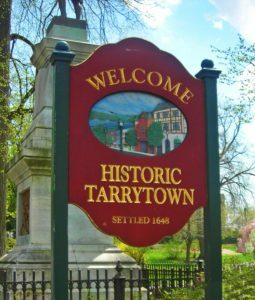 Tarrytown is a 5.7 square mile village within the town of Greenburgh in Westchester County, New York. It is located on the eastern bank of the Hudson River, about 25 miles north of midtown Manhattan in New York City, and is served by a stop on the Metro-North Hudson Line. To the north of Tarrytown is the village of Sleepy Hollow (formerly “North Tarrytown”), to the south the village of Irvington and to the east unincorporated parts of Greenburgh. The Tappan Zee Bridge crosses the Hudson at Tarrytown, carrying the New York State Thruway (Interstates 87 and 287) to South Nyack, Rockland County and points in Upstate New York. The population was 11,277 at the 2010 census. Tarrytown, home of the John. D. Rockefeller Estate Kykuit, is a small town with a rich history. It’s known for its thriving downtown area and its charming feel. 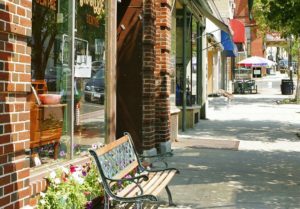 The Village of Tarrytown brings together the charm of an historic Hudson River town with the vibrancy of a living community. Busy Route 9 crosses its Main Street, the village’s commercial heart, which features low-rise buildings with storefront restaurants and shops with apartments above. A ride downhill on Main Street takes one past the older homes of the village and, toward the Tarrytown Metro-North train station, riverfront parks and residential developments; uphill there is a mix of new and historic buildings, many with river views. 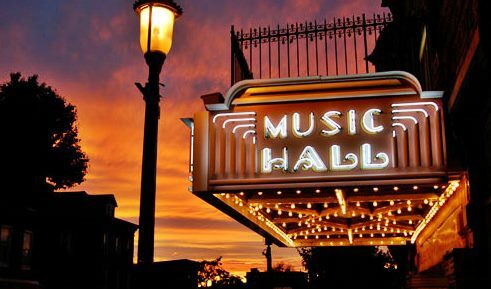 One of Westchester’s Hudson River communities, Tarrytown is a quaint village, just a short walk to the waterfront, the picturesque downtown has limited presence and is replete with antiques stores and both casual and formal eateries. Points of interest include Sunnyside, historic home of The Legend of Sleepy Hollow author Washington Irving; Lyndhurst, a 67-acre Gothic Revival mansion; The Castle on the Hudson, a Norman-style replica castle and luxury inn; and Tarrytown Music Hall, an 843-seat Queen Anne-style theater. Residents have access to the Old Croton Aqueduct Trail, a walking path that runs from Yonkers north to Croton-on-Hudson. For more information on Tarrytown please Click Here.